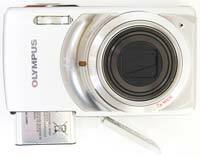 The Olympus Mju 7010 (also known as the Stylus 7010) is a new 12 megapixel compact camera with a 7x optical zoom lens. Offering a versatile focal range of 28-196mm, the Olympus 7010 also features a 2.7 inch LCD screen, Dual Image Stabilisation and AF tracking. 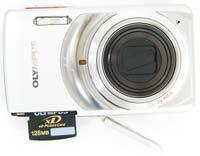 The i-Auto mode detects the five most commonly used scenes and adjusts settings, focus and exposure automatically. Images can be enhanced using the new Magic Filters, which include Pop Art, Pin Hole, Sketch, and Fish-Eye, and both xD-Picture Card and microSD Cards can be used. The mju 7010 is available now in Starry Silver, Titanium Grey and Candy Pink, with an official price tag of £249 / $199 in the UK / US respectively. With the focus of late on Olympus' fledgling digital Pen and, to a lesser extent, the Mju Tough range, it's easy to forget that the company also manufactures reliable, value for money and not altogether unattractive compacts - including the new 12 effective megapixel Olympus Mju 7010. So what makes this pocket-sized point-and-shoot contender, with a recommended UK price of £249, stand out from the crowd? Put simply: magic. Or rather, to be clear, a set of 'magic filters' that appears to be very similar in terms of built-in digital effects to the 'art filters' found on Olympus' E-series DSLRs and its aforementioned Pen. On the one hand, introducing these to the lower end of the market seems a sensible move in this age of identikit compact camera clones, but on the other perhaps undermines their desirability on the more expensive higher end models. Still, users get a choice of shooting in ultra vivid Pop Art filter mode as an alternative to the Mju 7010's rather cool and flat looking pictures when taken on standard default settings, plus further image enhancing options Pin Hole, Fish Eye and Sketch. Results vary with Pop Art and Pinhole being to our minds the most successful. Other key features worth flagging up include a 7x wide optical zoom equivalent to 28-196mm in 35mm terms that suggests the ability to take group portraits as well as extreme telephoto shots; an impressive specification given the otherwise slender proportions. Close focusing is down to 2cm, courtesy of a 'Super Macro' mode, which likewise isn't bad given its otherwise entry-level specification. Also 'not bad' though again no great shakes, is a light sensitivity range stretching from ISO 64 to ISO 1600 and all points in between, plus a standard issue 640x480 pixels AVI Motion JPEG movie mode with sound providing a maximum frame rate of 30fps, its duration limited only by card capacity. Suggesting itself as a family friendly option, we also get the promise of AF tracking, advanced face detection for up to 16 subjects, 15 scene modes, plus shadow adjustment and a beauty mode - located via a thumb twist of the rear mounted mode dial - that like Samsung's own, smoothes skin tones free of obvious blemishes. More predictable perhaps is that the camera is available in a choice of three finishes: titanium grey, candy pink or starry silver. We had the latter in to test. A mix of metal and plastic construction, the relatively slender (at 26.2mm 'wide') Mju 7010 feels solid yet lightweight (at 125g) when gripped in the palm and unobtrusive when slipped into a trouser pocket. From the front the (distinctly un-starry) mix of metallic silver and mirrored chrome detailing suggests a certain level of sophistication. 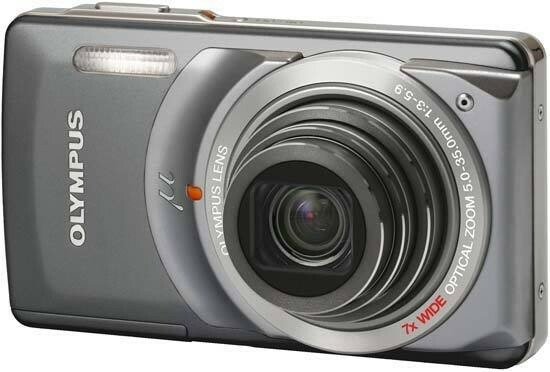 With the full extent of the zoom stored within the body when the camera is inactive, the overall look is clean, an indicator for the self timer set into the curve of the lens surround, just below the lozenge shaped built-In flash, and, top right of the lens, a pin prick indicating a built in microphone for movie mode and voice memos. Controls on the camera's top plate are set into a minimalist looking mirrored chrome strip that runs along the top and continues down both sides of the camera. Here we have a recessed on/off button and a lozenge shaped shutter release button, slightly raised to subtly suggest to first time users that this is where they should be placing their forefinger. Press the power button and, with a brief musical flourish, the rear LCD bursts into life and the lens extends to its maximum wideangle setting - a process taking just over a second. Which is quick for this class of camera. This rapidity extends to the lightning fast determining of focus and exposure, a central AF point illuminated in green and a beep of affirmation letting the user know it's OK to go on and take the shot. Go on to do just that and a maximum resolution JPEG file is committed to memory in just under three seconds - which is average for its class. Like recent compact competitors from Canon and Panasonic, Olympus has introduced its own take on intelligent auto functionality with the 7010, naming it the marginally different sounding intelligent i-Auto. This works in the same way as its rivals: point the camera at a given scene or subject, whereupon said scene will be quickly analysed and here one of a modest five given modes selected to provide optimal results. This helps further ensure that the Mju 7010's operation is literally point and shoot. While the front and top plate of the 7010 may indicate a small object of desire, the plastic-y controls of the Mju's back plate sadly serve as a passion killer. Indeed the otherwise very similar control layout on the FE-5020 model, cheaper by £100, is ironically better implemented and classier in appearance. The lion's share of the 7010's rear is naturally given over to a 2.7-inch, 230k dot resolution, LCD screen, but with little - if anything - provided on this camera for the user to get a solid grip on when shooting handheld, the screen inevitably becomes covered in greasy thumbprints. Visibility is, again, adequate for its class, and the provided resolution average, so you'll really need to download images to a desktop PC/Mac before critical focus and exposure can be properly determined. Thankfully Olympus has included dual image stabilization (mechanical and digital) to help combat the effects of camera shake, though like any such system it's not 100% reliable, if it is better than that of the FE-5020. Still, the camera is reasonably quick to respond to each button press and function selection, response times aided by Olympus' proprietary TruePic III processor. Exterior styling and usability aside, Olympus has also commendably (and thankfully) revamped the on-screen user interface that had previously remained largely unchanged throughout the range for most of this decade. The set up, camera and image quality icons remain cartoon-ish and friendly looking so as not to upset beginners, but now look less dated plus there is a greater fluidity to their selection and implementation. A case in point is that when you come to delete an image, pressing the dedicated button on the backplate, a trashcan pops up left of screen into which your image is visibly 'scrunched' and disposed of, with satisfying accompanying sound effects. The other controls on the backplate include a paddle-shaped rocker switch top right of the screen for adjusting the camera's zoom. Press this and the camera will glide from maximum wide-angle to extreme telephoto setting in just under two seconds, sound-tracked by an unobtrusive yet present mechanical whine. Beneath this control is a halfpenny-sized mode wheel - or dial - with beveled edge for catching the fingernail. Ranged around this are user-selectable options for program mode, iAuto capture, playback, movies, beauty mode and a combined scene mode. In practical terms, the fact that playback is accessed via a setting on the dial rather than having its own dedicated button has the knock on effect of the user not being able to quickly jump back into capture mode with a half press of the shutter release button should a photo opportunity unexpectedly present itself while reviewing pics; naturally the dial has to be first turned and one of the capture modes selected. Perhaps that's why Olympus has, just below the dial, unusually included a second means of playback in the form of an actual button ranged along a self-explanatory one for 'menu'. The pair form a second paddle shaped rocker switch that visually apes the one for the zoom. Press the playback side of the switch and, with a subsequent press of the shutter release button, the camera will indeed throw the user back into capture mode if desired. Moving back to the dial, take a picture in beauty mode and, displaying cutesy graphics that wouldn't look out of place in Disney's Cinderella, the camera automatically smoothes skin tones and brightens eyes while a 'busy' progress bar appears at the bottom of the screen, and the image itself hypnotically slides around the screen. You can set these adjustments to soft, average or strong within the camera's menus, but it appears to need the subject facing the camera with both eyes open for the face to register and the function to work; turn side on and it's no good. In terms of navigating around the Mju's cartoon-like menu system, while on the whole it's an intuitive process we felt operability could have been further improved with the addition of a dedicated 'back' button to allow the user to jump back to the main menu to make further selections after they have made their initial choices - or had a change of mind. Beneath the menu and playback switch is a square four-way control pad with an OK/function button at its centre. At 12 o'clock on the pad is a means of manually adjusting exposure compensation (a choice of +/- 2EV) with thumbnail images on screen helpfully providing a neat visual representation of the effect incremental changes will have. At three o'clock we get a means of selecting from the camera's modest flash modes: auto flash, red eye removal, fill-in or off. Also modest is that the self timer control that follows at 6 o'clock on the dial can merely be set to on or off, while last but by no means least at nine o'clock we have a choice of macro or super macro settings - the latter allowing the user to get as close in as 2cm. The final buttons - or rather, again, shared paddle switch - are for adjustment of the LCD display and/or image deletion. Press 'display' and on-screen info disappears to provide a 'clean' view of your subject, press again and a nine zone compositional grid pops up; press a third time and unexpectedly a real time histogram appears to enable the user to check exposure is even across the image. While that's it for the camera's backplate, the right hand side provides an eyelet for attaching a wrist strap and the base features an unprotected port for USB 2.0 cable. Next to this is a flip-open door protected by a catch that jointly houses the rechargeable lithium ion battery and slot for optional removable media card. Indicating the Mju is aimed at users upgrading from camera phones, an plastic adapter for use of a microSD card is also provided; otherwise the slot provided is for the now surely outgunned (by SD/SDHC) XD-Picture Card, which of course, like Fuji, Olympus originally had a co-development interest in. Any card is of course an optional extra - no removable media is provided in the box, though there's a small 36MB internal memory to get you started.